Mary Rabago speaks to a student after her talk Thursday night. 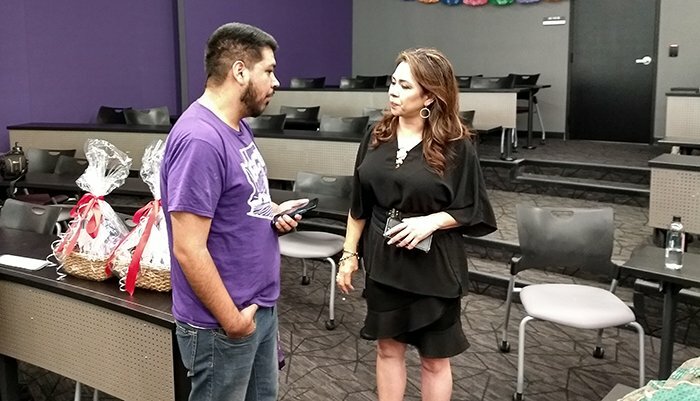 The family-oriented success of the Latino Student Union at Grand Canyon University was on full display Thursday night when the club welcomed its most high-profile speaker ever. As a follow-up to Cesar Chavez Day celebrations on March 31, award-winning journalist Mary Rabago engaged with a large gathering of students for more than hour in the Colangelo College of Business (CCOB) Building. She talked about her work — she is best known as an anchor for Univision — as well as her opinions about today’s issues, but her main message was unity and family. And that fits with what the Latino Student Union is all about. The club boasts more than 300 members, according to its Facebook page, and consistently draws a multicultural mix of students to its events. “We’re a very inclusive club. We don’t try to discriminate against anyone,” said senior Leonardo Quintero, the club’s president the last two years. “We just focus on welcoming anyone. Rabago’s visit was facilitated by CCOB Professor Eduardo Borquez, one of the club’s advisors, along with Dr. Noé Vargas of the College of Humanities and Social Sciences. Rabago’s message of inclusiveness fit right into the ideals the Latino Student Union preaches. When a student who’s the son of German parents asked her how to bridge the cultural divide, she emphasized starting conversations with things we have in common. The very same reason so many students were there Thursday. “This club is a home away from home for a lot of Latino students and for a lot of people who want to learn about Latino culture,” Lizaola said. “They come to us because we have that family aspect, we have that unity, and it’s really easy to come out here and make friends and build relationships. Rabago devoted the first part of her talk to her memories of Chavez, who organized the United Farm Workers and is famous for his nonviolent approach to civil rights. She is passionate about the topic because she is the daughter of a farm worker. “I can relate to Cesar Chavez in many ways,” she said. In addition, she said, anyone who resorted to violence was sent away. He wanted no part of that. Also at Thursday’s gathering was Tatiana Crespo, the Costa Rican accordion player who wowed the TEDxGrandCanyonUniversity crowd in February. Talk about a 1-2 punch of speaking and performing, but that’s what Quintero has built the last two years – the group has an event coordinator and marketing director in addition to the president, vice president, treasurer and secretary required of any club, and the officers for the 2019-20 academic year already are in place. An example of that education: The club worked with the Canyon Activities Board to hold a salsa-dancing event – it included other dances as well. The idea was to show students from other cultures that just because someone is Latino, they don’t necessarily do the salsa. “We’re not a salsa-dancing club,” Quintero said. In fact, it’s not really a club at all. It’s a family – a multicultural family.